Discover Key West travel guide Key West, Florida. Sign up to receive hot Key West travel offers and information. Key West Pro Guides, Over 20 Owner Operated Charters to choose from! Full Time Professional Guides, Productive Quality Trips, 1000's of Satisfied Customers. 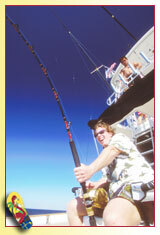 Day & night deep sea fishing trips w/ experienced guides. We offer a variety of half-day or full-day packages that will meet your needs. Our party boat, Agent 001, along with our catamaran, Agent 002, offer a different style than any other charter boat. Fight your fish of a lifetime toe to toe while standing up using light tackle gear. The Intense, our 32' Yellowfin center console, is a versatile fishing machine with state of the art electronics to get you to where the fish are quickly and comfortably. Fish aboard our Eva Marie which can take up to 6 anglers for an adventure to the reef & beyond for some world class sport fishing - Sailfish, Marlin, Dolphin, Kingfish, Grouper, & more! Fully equipped w/ the finest tackle, air-conditioned cabin, & head. The 63' Blind Squirrel has 4 heads, lg cabin w/ AC, 2 dinettes, full galley, refrigerator, microwave, cook top, coffee maker. Licensed for 41 people for day trips, 12 people on overnight charters. Book 1/2, 3/4, full day or a Dry Tortugas Fishing Charter. Key West Pro Guides, Over 20 Owner Operated Charters to choose from! Full Time Professional Guides, Productive Quality Trips, 1000's of Satisfied Customers, Reputable and Dedicated, Come experience what GREAT Key West fishing is all about! Fish the waters Ernest Hemingway loved for sailfish, marlin, dolphin, wahoo, king, barracuda and many more hard fighting fish. Established since 1938, the Linda D. provides bait, tackle, ice, and fishing licenses. Full or half day. 78 years in business! Pristine blue waters, beautiful weather, lots of fish...get it all at Mean Green Charters! Captain Jake Perry takes you to the ultimate fishing sites. Deep sea, reef, wreck, or blue fishing. Come see the best in Florida Keys fishing for yourself! Mr. Z is one of the Florida Keys premier sport fishing yachts. The 46 foot Bertram sport fishing yacht is fully air conditioned & accommodates up to six guests, with stereo, CD player, refrigerator, freezer, carpeted lounge area & fully equipped galley. A technical saltwater fly fishing outfitter, we sell the finest gear & provide outstanding Guide Services for every type of fishing in the Keys suited for your needs and ability. Tony Murphy has created the ultimate experience for fishing in Key West. A 46' Bertram sportfishing machine equipped with A/C, clean restroom, premium electronics, rods & reels, and a live bait well. We fish deepsea, offshore, wrecks, reefs, trolling, kite fish, jigging & deep drop. Come onboard and make a great memory! Floridakeys.com accepts no liability with regard to the accuracy of the information on this site. Visitors to the site are advised to double check information such as dates, times, and prices.